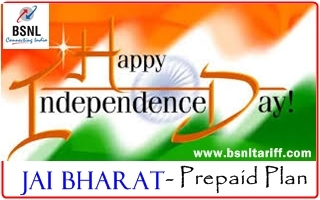 Most Trusted Telecom Brand in India Bharat Sanchar Nigam Limited (BSNL) has launched new promotional offer Prepaid Plan on occasion of upcoming ‘Independence Day’ for limited period of 90 days under Prepaid Mobile Services across Punjab Telecom Circle. The BSNL Competent Authority of Punjab Telecom Circle has introduced new prepaid plan ‘Jai Bharat’ for all New and Existing Customers across Punjab Circle. 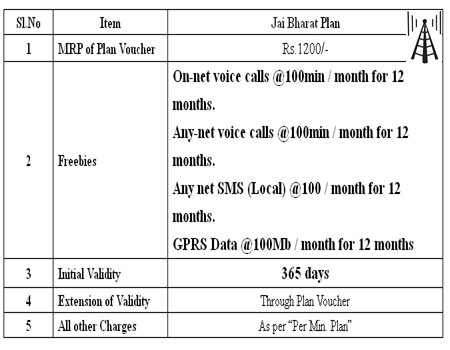 The New ‘Jai Bharat Prepaid Plan’ offers, On-net/Off-net Voice calls @ 100minutes per month for 12 months, SMS any network @100 per month for 12 months and GPRS data @100Mb per month for 12 months with validity for 365 days (One Year). The above new promotional prepaid plan will be implemented and with effect from 02-07-2013 to 29-07-2013. (For 90 days). Balance of previous month will be Carried Forward. DA base SMS pack will not be applicable to this plan. DA base Voice Special Tariff Voucher (STV 135) will also be not available to this plan. Video call STV 57 will not be applicable on this plan.